The Yonico 14705 Rabbet Router Bit Set, complete with 6 bearings, will make rabbet cuts in 6 different sizes. Can be used to cut lap joints as well. Rabbet cutting depths are as follows: 1/2", 7/16", 3/8", 5/16", 1/4" & 1/8". 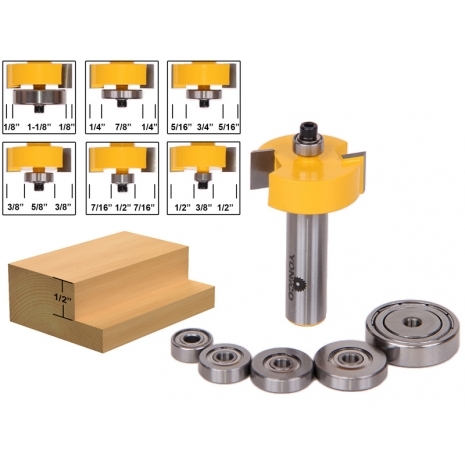 6 bearing sizes include: 3/8", 1/2", 5/8", 3/4", 7/8" and 1-1/8" with inner diameters of 3/16". Two flute carbide cutters and 1/2" shank.